The ones above are a few favorites I've been looking at but I'd love to hear what you think. Do you have any of these and want to chime in on the quality? Have some other suggestions? We're looking for some stockings this year too, I think its time to toss the Big Lots ones we got for a wedding present! I really like the West Elm ones. I like the burlap ones too but I'm nervous that the burlap thing will go out of style and I won't like them anymore. Can't wait to see your mantle! It's super easy to make your own with felted wool - I made ones from thrift store sweaters in great patterns, felted them in the wash, then cut them out to a template and sewed them up. Made them for my sons out of vintage velvet. My oldest son's was reversable - a beautiful dark red velvet on one side and rich green on the other, topped with a piece of faux white fur that was amazing. My youngest son I let him pick out a bunch of fabric from samples we had from an upholstery shop. I sort of crazy quilted them together but the shape was an elf like stocking. They both love them. for the baby. When I was growing up, my siblings and I all had personalized matching stockings, and it was so exciting to pull them out every year. I'm looking forward to reviving that experience! Cute! We never did stockings when I was a kid so Im excited about having the tradition with her. I have the quilted velvet ones from Pottery Barn. We'll be keeping ours for a good while, too, and I feel like those stockings are classic enough to look good for years to come without being too traditional. Also, you can always tie a ribbon through the loop or add some other small touch to change it up. I'm going to add pom pom trim this year by safety pinning it on the underside - easy to remove when I'm over it! I just ordered some a couple of weeks ago off of zulily. I agonized over it for way too long because I want to keep these forever. But now I am about to cry because the West Elm ones you linked are exactly what I wanted. Mark and Graham.com has a nice neutral option and etsy had some good burlap ones. Totally forgot about that site. Those natural quilted ones are pretty too. Just had a vendor at a vintage show - www.goathillfair.com - share their lovely Christmas stockings. They are made of fine grain sack fabric. The men selling them are the FABULOUS guys of Uber Chic. You can find them on facebook and buy from them directly. We have the same pottery barn (velvet with the stitching). I love them and think they will be great for a long time. My only complaint is that I bought mine two years ago and the ones they are selling now are slightly smaller. So now I'm on the hunt on ebay to find one of the larger size that I have (hasn't been easy). If you have any inkling of having more children I'd buy an extra just to be safe.... you can always find someone to embroider it. Funny you mentioned you had stockings from Kmart. Years ago (at least 10), when Martha Stewart was at Kmart, I bought two stockings for my young daughters. They had felted patterns & rickrack on them; one with Santa & one with Rudolph. I added their names with fabric paint and they are still my favorite. They look homemade and have held up so well. I wish I had bought the other matching patterns but I have had no luck on ebay. BTW All your choices are so pretty but my favorites are the top left corner. They look simple & classic with just enough color to make them festive. Good luck deciding. Our Kmart stocking were not the cute Martha ones...they are blue and purple furry ones that held up okay but just have never been my style. So I'm glad to be able to replace them. I like the ones at the top left corner, too, with the West Elm ones second. You have to consider their sturdiness and some of the other ones (knitted and burlap) might not hold the goodies very well. We love Land's End and LL Bean stockings, though all of ours are homemade over the years. When Thing 2 made his debut last year I decided to invest in stockings instead of having our motley collection from World Market and Lillian Vernon. Got the kids Fair Isle stockings from PBK and love the quality + size. I might get 2 more for me + the Mr. in the Natural Fair Isle collection. Thanks so much for posting this. I sewed some for us 4 years ago, but I am ready to make some new ones for our mantel this year. I hope I have time. As far as looks, I like the Garnet Hill ones, not so serious and fun festive colours, but they don't look like they would hold a lot or they would stretch out. I have three from Pottery Barn. Really pretty and nice and a good size, but after awhile ... I dunno, nice but not so fun. My grandma made us our stockings out of our old baby blankets or dresses, etc. I still have mine, ragged though it is. I bet Miss Agatha has a wee outfit or blanket that'd make a darling stocking, and it'd be all the more special to her if you made it. You could then buy yours and Mr Limestone's to match, or make yours out of something meaningful, too. That is a super sweet idea. Sewing is definitely not a strong point for me so I dont think I could conquer that but still a great suggestion. If you'll be considering kiddo #2+ in the future, I'd be wary of purchasing thru Etsy, you might not be able to find a stocking to match the first 3. I'd go with the Pottery Barn ones, cute & classic and will probably be around for a while. If I were looking for stockings, it would be so hard to pass up those striped knit one! They make me smile. After the kiddos grew up and moved away (they're now 42 & 47 which is really amazing) I made burgundy velvet elves boots with puffy white chiffon cuffs embellished with Austrian crystal hanging snowflakes. They suit us and our home. The knit one are definitely charming but not sure if I could actually fill them with anything without destroying them. Check out the South House Designs Stockings for sale featured in the above post at The Yellow Cape Cod. 96 different materials and stunning designs. Those houndstooth stockings are seriously adorable! Since we will only have the one forever, Im afraid to get something too specific since I might get bored with them but these are pretty fabulous! I do love the quilted velvet.... but of course, it's Agatha who will remember her stocking when she is grown, and it is likely that her own designer gene will not come out for a while! So why not buy more than three (in case of additions) in the style you love for your house, but get Agatha one for the end of her bed that she will get excited about all the time she is small? Whatever you choose, I am sure it will be the right one! I like stretchy ones and yes, they may stretch out but that just makes them look like they've been filled many times over the years with fun stocking stuffers. My mom would stretch them OUT, and it was so fun to see them all distorted with treasures. You are so crafty I am surprised this is not a post about how you made your own stockings. My mother made all our stockings (she had 6 kids) and we each had one that lasted forever. I still have mine and copied her style to make my children's stockings. It's a felt stocking with the name at the bottom and decorations hot-glued or stitched on (just like my Mom made). We also have the quilted velvet PB stockings and are still very happy with them four years later. Hubby and I have ivory stockings with red embroidery and we just ordered our peanut a red one with ivory embroidery. Peanut #2 is due in April so I'm happy PB still offers this style and hope they keep it up so I can order a fourth one next year. Thanks! I'm pretty sure I'm going to go with them. They are a great price point and seem versatile enough that I wont tire of them too quickly. 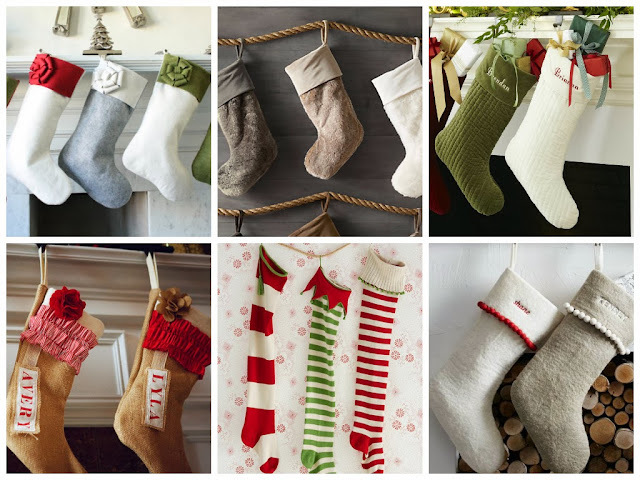 Christmas stockings are something that have been cherished in our family for generations. If you would like to see some wonderful stockings and read a very touching story please follow the link below. We still make these stockings in our family to this day! Let me know what you think. I can vouch for the Pottery Barn stockings. They're really well made, have nice strong tabs and have lasted us several years already with no sign of wearing. Like you, I wanted to invest in something that I could use "for eternity." #2 and #4 I think are too trendy to be considered for that. I love the classic look of #5, but I'm not overly impressed with Garnet Hill's quality and I think those in particular would pose an even greater problem because they're thin. I like #3 and #6 best, but would opt myself for #3 because I have had a good experience with my first set (all of which we embroidered). Good luck! Thanks for the information. I'm pretty sure I'm going to go with those for all the reasons you mention. The only tiny critique I have is with the striped ones. They're lovely to look at buuuuut…they're stretchy, which makes retrieving goodies and presents that much harder for little hands. I speak from the frustration of childhood experience. Other than that, there aren't any bad choices here. Second the stretchy comment about the ones from Garnet Hill. We have stockings like these, and they stretch very badly. They look great being hung by the chimney with care, but once Santa fills them, they have to be placed on the floor. Bummer.